Purchasing the right Excelta tweezer is important, and there are so many options available which can make it difficult to make the right decision. Excelta's Five Star Quality System takes the speculation out of overall quality; however quality is not the only variable when it comes to choosing the right tweezer. 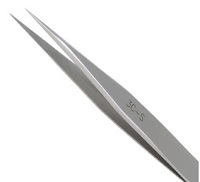 Here we have provided some additional information to make the selection of straight tip stainless steel tweezers easier. The Excelta 3C tweezer is comprised of carbon steel, and therefore is highly magnetic and not very resistant to oxidation. If your workplace environment has consistently low humidity level and magnetism won't effect and of the parts then this may be the tweezer for you. The largest benefit of carbon steel is the incredible durability of the hardened tips. The Excelta 3C-S tweezer is composed of AISI 420F stainless steel coupled with Carbon, which makes for less durable and less magnetic tips than the Excelta 3C tweezer. 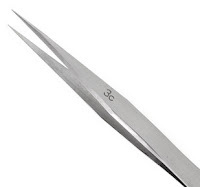 The benefit is that these tweezers have a better resistance to oxidization but still may rust in extreme humidity conditions or over long periods of time. The Excelta 3C-SA tweezer is produced with AISI 316L stainless steel which has very minimal carbon. Which makes for an extremely rust resistant tweezer that is also antimagnetic. AISI 316L stainless steel is significantly softer than AISI 420F Stainless or Carbon Steel, which means the tip is much softer and lacks durability. On a side note, heat and friction may cause some magnetism so keep that in mind as well as depending on your given needs. 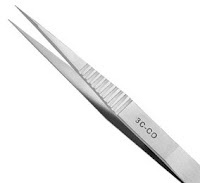 The Excelta 3C-TA tweezer is made of a titanium allow. It is completely non-magnetic and heat resistant to 806 degrees F. The #C-TA is the ideal choice for soldering applications or when dealing with acids. The Excelta 3C-CO Cobaltima tweezer is comprised of 40% Cobalt Steel alloy, which makes for an awesome combination of strength and resilience. The allow provides tips that are insensitive to fatigue and keeps their elastic properties. Overall, the 3C-CO offers exceptional resistance to corrosion, resistance to temperatures up to 932 degrees F, are anti-magnetic, and also feature finger serrations - an additional benefit for added grip. Janel sells and distributes the complete Excelta Tweezer line. 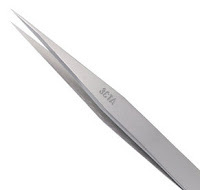 To shop select tweezers such as (blunt tip tweezers, carbofib tip tweezers, flat round tip tweezers, very fine tip tweezers, delrin tip tweezers, and many more types) visit Janel Online's Excelta Tweezer Page here.